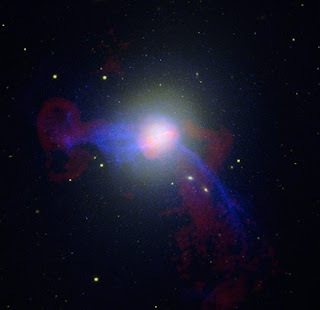 This image is a composite of visible (or optical), radio, and X-ray data of the giant elliptical galaxy, M87. M87 lies at a distance of 60 million light years and is the largest galaxy in the Virgo cluster of galaxies. Bright jets moving at close to the speed of light are seen at all wavelengths coming from the massive black hole at the center of the galaxy. It has also been identified with the strong radio source, Virgo A, and is a powerful source of X-rays as it resides near the center of a hot, X-ray emitting cloud that extends over much of the Virgo cluster. The extended radio emission consists of plumes of fast-moving gas from the jets rising into the X-ray emitting cluster medium. In X-rays, M87 also reveals evidence for a series of outbursts from the central supermassive black hole. The loops and bubbles in the hot, X-ray emitting gas are relics of small outbursts from close to the black hole. Other interesting features in M87 are narrow filaments of X-ray emission, which may be due to hot gas trapped by magnetic fields. One of these filaments is over 100,000 light years long, and extends below and to the right of the center of M87 in almost a straight line. The optical data of M87 were obtained with Hubble's Advanced Camera for Surveys in visible and infrared filters (data courtesy of P. Cote, Herzberg Institute of Astrophysics, and E. Baltz, Stanford University). Wide-field optical data of the center of the Virgo Cluster were also provided by R. Gendler (Copyright Robert Gendler 2006). The X-ray data were acquired from the Chandra X-ray Observatory's Advanced CCD Imaging Spectrometer (ACIS), and were provided by W. Forman (Harvard-Smithsonian Center for Astrophysics) et al. The radio data were obtained by W. Cotton and also archive processing using the National Radio Astronomy Observatory's Very Large Array (NRAO/VLA) near Socorro, New Mexico.